A few details about some of the parts I'm using. I've bought quite a few motors and drives from http://www.hobbypartz.com for use on tri copters, quad copters, and RC planes. I have been pleased with their performance and cost. They usually have free shipping on orders over $100 and occasionally have 10% off sales. 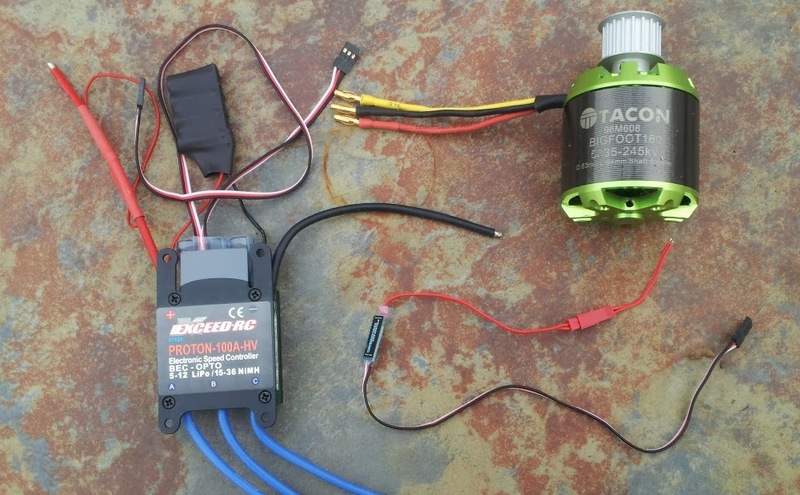 The motor is the Tacon Bigfoot 160.... it is a 63mm x 64 mm motor with 245 KV and rated about 2700 watts. It is the biggest motor they sell and normal price is about $55. I bought three of them... two for trikes and 1 for a Yak 54 with a 72 inch wing span. I just ran it yesterday on the plane with a 16 x 8 prop and it was pulling a little over 50 amps on 44 volts for around 2100 watts at full power. A bigger prop would up the power but probably gonna try it with that prop. I'll try it again in a few days and measure the thrust. The drive is a 100 amp HV good for 12s LiPo and came with a couple of undocumented (on their webpage) addons. Four capacitors in parallel across the power input terminals. An interface that I think you can hook between two motor phases and gives you a low level output that could go to a tach or possibly a governor on helicopter applications. I'm not planning on using that. The drive is about $115 and so far is performing well. It does not have the battery eliminator circuit so power for my RBB servo tester is from a 7.4 volt battery. the RBB board has a 5 volt regulator on it. These are both clones or renamed devices available from other sources I'm sure.